The Science Development Report, which has been published successively by CAS over the past 18 years since 1997,prepares important grounds for macroscopic decision-making on S&T advancement. 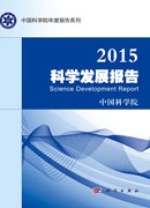 The content of this year's edition includes a comprehensive analysis of the world's frontier science development in 2014,an outlook on research advances in major science fields, reports on representative achievements of Chinese scientists, observations on world's S&T development, strategic planning and layout of science and technology,a brief account of overall science progress in China, and suggestions on science advancement in China. 2.8 Progress in the Study of "Mapping Brain Functional Connections"